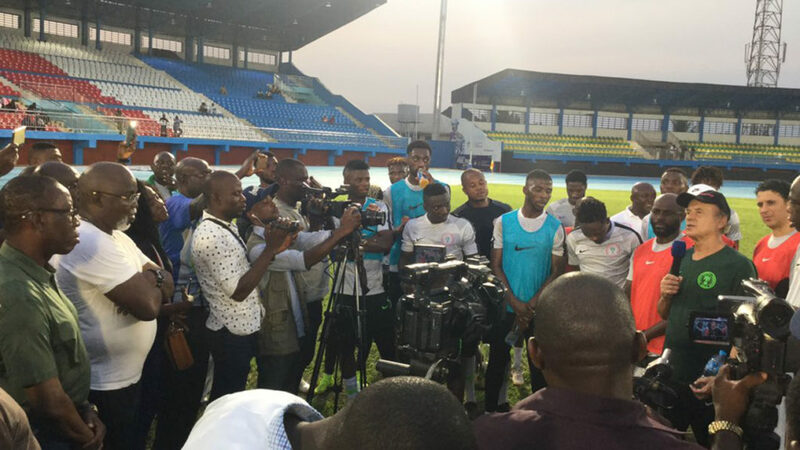 [FILE PHOTO] Delta State Governor, visiting Rohr, Super Eagles at training session at the Stephen Keshi Stadium, Asaba. Super Eagles Technical Adviser, Gernot Rohr has lamented the injuries and suspension that have robbed him of four of his regulars for today’s crucial 2019 AFCON qualifier against the Bafana Bafana of South Africa, but he is comforted that the situation has presented opportunities for some other performers to step onto the runway. First choice goalkeeper Francis Uzoho, wing back Abdullahi Shehu and forward Odion Ighalo – top goal scorer in the 2019 AFCON qualifying race with six goals – are not in South Africa as a result of injury, while lion –hearted midfielder Wilfred Ndidi is suspended after cards against Seychelles and Libya. Nigeria’s 23-man squad for this game includes former U-17 World Cup winners, Kelechi Iheanacho, Isaac Success, Victor Osimhen and Samuel Chukwueze, who, amongst them, must step up for the main striker’s mantle in the forced absence of Ighalo. There are also France-based Samuel Kalu (good outings away to Seychelles and at home to Libya), and Henry Onyekuru who plays in Turkey, not to mention Musa, Nigeria’s highest goal scorer ever at the FIFA World Cup. While Rohr has to deal with the absence of four regulars, Bafana Bafana Coach, Stuart Baxter is not better off, as Dean Furman, Bongani Zungu, Keegan Dolly, Sibusiso Vilakazi, Bradlet Grobler and Kamohelo Mokotjo are not available. While Percy Tau and Thulani Serero are real threats, Tokelo Rantie, who scored three of South Africa’s last five goals against Nigeria, is out of the picture having been sacked in Turkey and presently nursing a new career as a farmer.